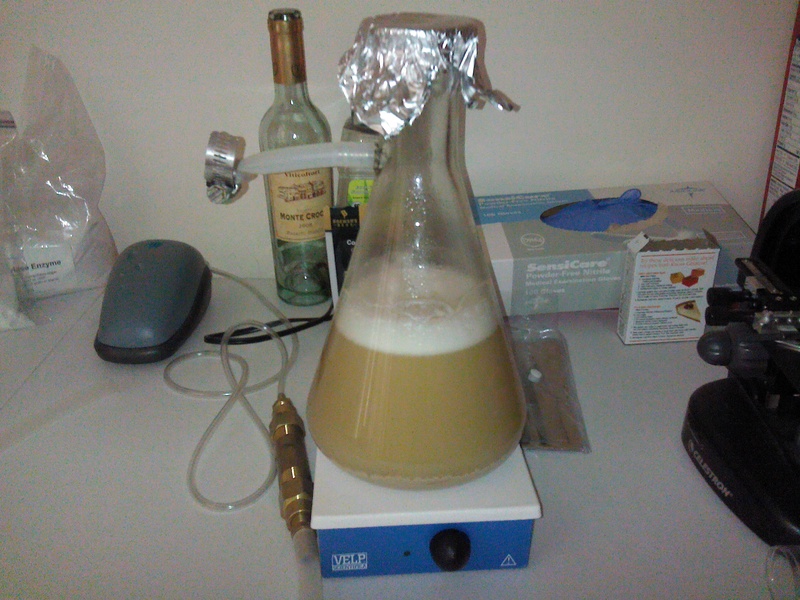 36 hours on stir plate, WLP 001 first gen is at high krausen! Let’s face it, there comes a time in every homebrewer’s or brewmaster’s life when they become curious about the wild side of fermentation. Sure Saccharomyces cerevisiae & Saccharomyces pastorianus (brewer’s yeast) is a great companion and all, but at times the wild critter’s are needed to achieve a certain beer style. 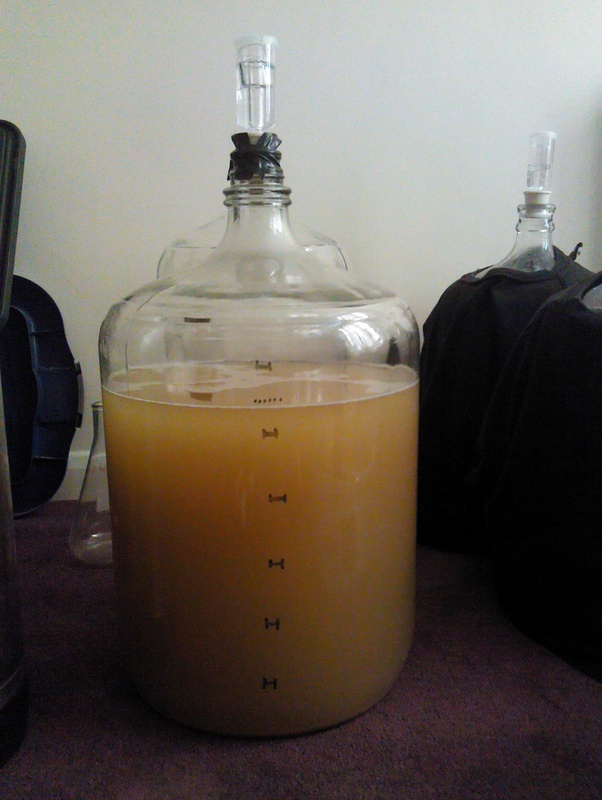 Of course there are several issues with crossing into the wild side of fermentation. For instance, there’s not very much scientific/experience data out there with all of the wild critters that can help guide the average-Jo unless they have a Graduates in Fermentation Science or Microbiology. These wild critters can be very unpredictable, general knowledge states that for beer to taste better to ferment on the cool side of the spectrum. This prevents our S. Cerevisiae and S. Pastorianus comrades to put out nasty off flavors. There are numerous of wild critters out there that are desired for certain beer styles, some of these styles include Berliner Weisse, Lambics, Flander’s Red Ale , Flander’s Oud Bruin, Fruit Lambic, Gueuze, Kriek, and several others. 5 lb’s, 60/40 Pils/Wheat ratio in the mash! So what are these wild critters that I speak of? Well, I won’t go into specific strains for there are far too many to list but I will give a general idea of what they are. These include Brettanomyces, Pediococcus, Lactobacillus, Enterobacteriaceae, and Acetobactor. I won’t go into the nitty gritty of the characteristics on the wild critter’s except for one as this is the critter that we’re focusing out attention on today in the brewhouse. We’re seeking to brew a Berliner Weisse and this beer is very unique as it focuses on a symbiotic relationship between S. Cerevisiae and Lactobacillus delbrueckii or other strains of Lactobacillus. But where does one get a hold of this known beer spoiling organism? Well, there’s numerous of places in your house where you can obtain this critter. Do you have cabbage or cucumbers in your fridge? Well, chances are that you have Lactobacillus. Got some Pilsner/2-row/6-row malt laying around? Odds are you got Lactobacillus there too. Got some yogurt with live culturs in it? You definitely got your Lactobacillus in there (I’ve never tried this before, although it’s frowned upon through this route…). In short, you have Lactobacillus in your house or brewery already. 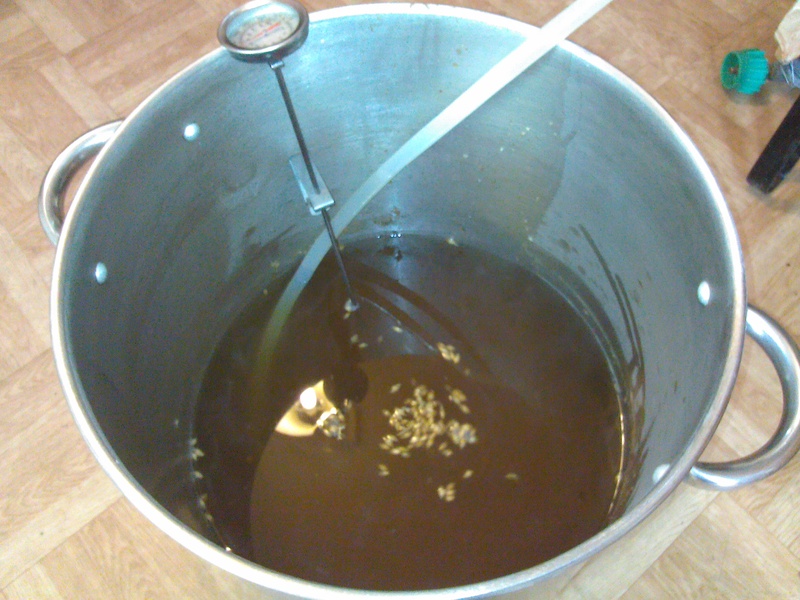 Generally most homebrewer’s and brewmasters do everything in their power to avoid this critter. Or if you’re lazy you can just buy a pure Lactobacillus culture from White Labs or Wyeast.Lactobacillus is actually a very temperamental organism, it doesn’t like oxygen, cold temperatures, and hops (for the most part). There are some hop resilient strains out there, but White Labs and Wyeast strains do not like highly hopped beers. We’re taking out chances by obtaining our Lacto bug from Brewferm Pilsner malt. This particular batch is very dusty so we’re very curious on how this will turn out. Our yeast strain of choice to ferment this out is WLP 001 Cali Ale yeast from White Labs. It’s on a stir plate at high-krausen as we’re brewing today. We’re also trying out a lot of different brewing techniques today as the brew day progresses. For example, we’re mash hopping this beer with low alpha-acid hops (Hersbrucker), we’re single decocting this brew and proceeding with a no boil as well. This is our smallest grain bill we’ve ever brewed with as well! For this 5 gallon batch we’re only using 5 lb’s or grain with a 60/40 ratio of Pilsner/Wheat malt for this Berliner Weisse. Aroma: A sharply sour, somewhat acidic character is dominant. Can have up to a moderately fruity character. The fruitiness may increase with age and a flowery character may develop. A mild Brettanomyces aroma may be present. No hop aroma, diacetyl, or DMS. Appearance: Very pale straw in color. Clarity ranges from clear to somewhat hazy. Large, dense, white head with poor retention due to high acidity and low protein and hop content. Always effervescent. Flavor: Clean lactic sourness dominates and can be quite strong, although not so acidic as a lambic. Some complementary bready or grainy wheat flavor is generally noticeable. Hop bitterness is very low. A mild Brettanomyces character may be detected, as may a restrained fruitiness (both are optional). No hop flavor. No diacetyl or DMS. Mouthfeel: Light body. Very dry finish. Very high carbonation. No sensation of alcohol. Overall Impression: A very pale, sour, refreshing, low-alcohol wheat ale. Comments: In Germany, it is classified as a Schankbier denoting a small beer of starting gravity in the range 7-8°P. Often served with the addition of a shot of sugar syrups (‘mit schuss’) flavored with raspberry (‘himbeer’) or woodruff (‘waldmeister’) or even mixed with Pils to counter the substantial sourness. Has been described by some as the most purely refreshing beer in the world. History: A regional specialty of Berlin; referred to by Napoleon’s troops in 1809 as “the Champagne of the North” due to its lively and elegant character. Only two traditional breweries still produce the product. Ingredients: Wheat malt content is typically 50% of the grist (as with all German wheat beers) with the remainder being Pilsner malt. A symbiotic fermentation with top-fermenting yeast and Lactobacillus delbruckii provides the sharp sourness, which may be enhanced by blending of beers of different ages during fermentation and by extended cool aging. Hop bitterness is extremely low. 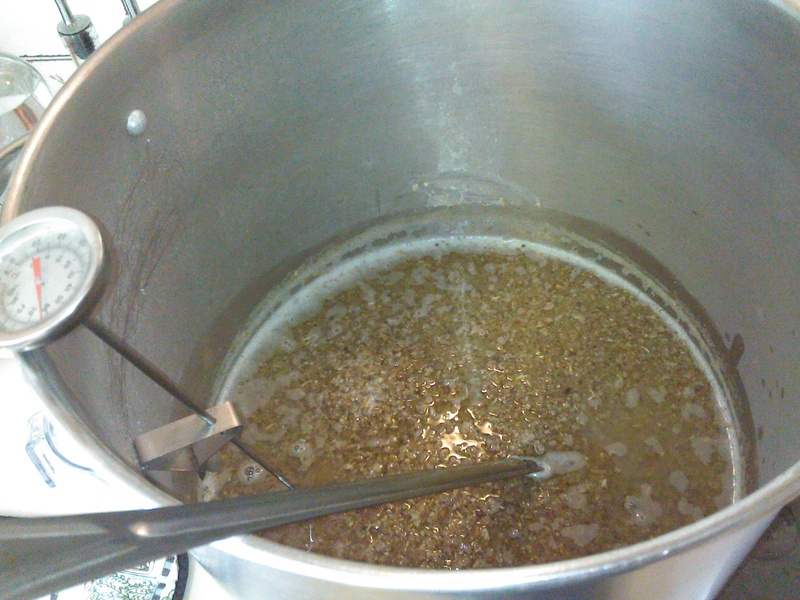 A single decoction mash with mash hopping is traditional. Kettle full of grain dust and hand full of grains while sparging, wort temp 124F. 60/40 ratio for Pilsner and Wheat malt mashed at a low temperature to ensure an extremely fermentable beer. Since we stove top mash in our kettle, we crushed the grain over the kettle to spread malt dust all over it (you’ll see why we did this in a minute). We mashed in with 1 1/2 gallons of hot liquor (water) to the 5 lb’s of grain the mash tun was only a quarter of the way full (first time ever!). After 20 minutes from mashing in we added 1 oz of Hersbrucker hops and according to our calculations that will bring us to 3 IBU’s of bitterness..craziness! Our total time for mashing our grains was 90 minutes to ensure full conversion of the starches into precious sugars. We then transferred the mash into our lautering tun and began fly sparging into the unwashed kettle. It still has dust from the middle on up from when we crushed the grains and had some left over grains from the transfer. This will give the Lactobacillus a head start on the brew because by the time the wort hits the kettle it’s at a temperature of 120F. Which is the prime temperature for Lactobacillus to to it’s job of inoculating the wort, now it all makes sense! (as a side note, we sanitized anything that came into contact with this brew to prevent other nasty’s in getting into this brew) We’re also not boiling this brew to prevent DMS (a corn-like off flavor) since this is supposed to be a clean-crisp-refreshing beer. To ensure Lacto does get inoculated in this brew we’re also tossing in a handful of grains as we sparge into the kettle. Our starting OG for this brew is 1.028 @ 5.5 gallons, SRM (color) 2, and the IBU’s (bitterness) is around 3 (calculated), and 84% brewhouse efficiency! We plan on a 2 month fermentation regiment and bottling this brew, this beer is rarely found on tap and we plan to continue with the tradition of this very elusive brew. This beer will be served with raspberry syrup when it’s ready and we look forward to raising a pint with you!